Friday’s Hallmark Channel Countdown to Christmas movie is “Pride, Prejudice, and Mistletoe,” starring Lacey Chabert and Brendan Penny. Darcy (Chabert) has always worked hard to prove herself and be successful on her own terms, even choosing to start her own company, rather than work with her father. Returning to her hometown for Christmas, Darcy reconnects with an old rival, restaurant owner Luke (Penny), and they are forced to plan a charity event together. As Darcy spends time with her family and Luke, she starts to realize what matters most in life and sets out to mend her relationship with her father, and possibly fall in love. In a preview clip, there is a scene where it appears the couple must be Luke’s restaurant because there is a huge industrial table filled with salad ingredients. 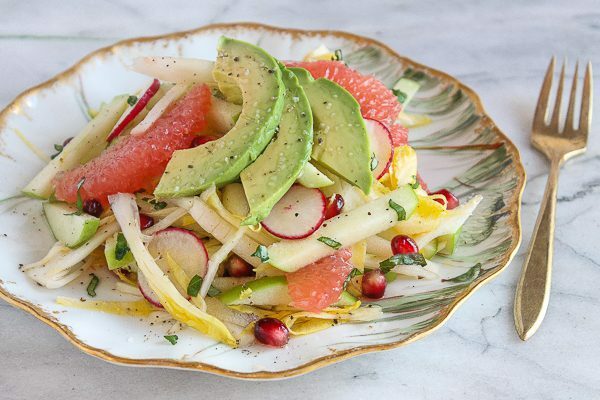 I offer a beautiful and festive salad recipe from Top Chef winner, and owner of Girl and the Goat in Chicago, Stephanie Izard. The recipe is from her great cookbook, The Girl in the Kitchen. 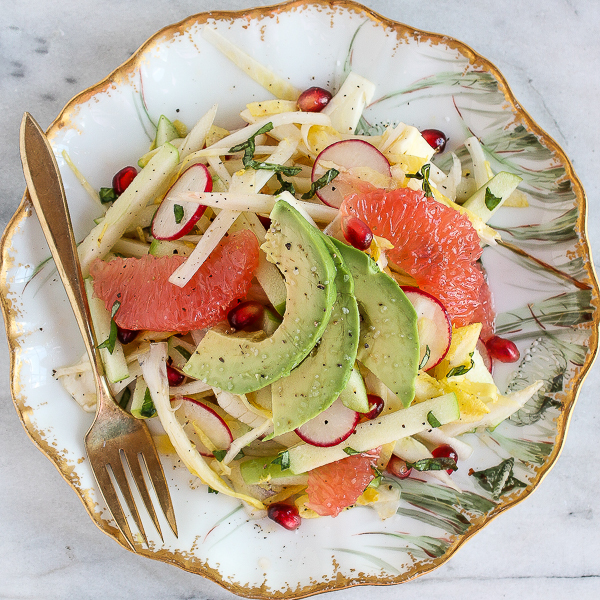 It looks like a holiday salad with its grapefruit and honey vinaigrette, and salad ingredients like crisp Granny Smith apples, sparkling pomegranate seeds, bright red radishes, and slices of avocado. You can find the recipe here, and also read about Stephanie Izard. I tried to find it online, but only could find lots of personalized apron sites. Maybe Hallmark had it made just for the movie? Enjoy the weekend! Is everyone having turkey leftovers made every which way? We always do, beginning with making turkey stock first thing for turkey-rice soup, which is my Bill’s favorite. And I just might make that wonderful salad again. my granddaughter and soon to be granddaughter-in-law for next Christmas 2019! I am just one of your thousands of loyal fans – period! Hi Ruth- I think many people loved that apron, including me! I couldn’t find the exact apron from the movie, but my guess is that it was customized. I found a site, https://www.cafepress.com/+funny-baking+aprons that will custom-make aprons, so hopefully you will be able to order from them. You’re right – they would make a great Christmas gift. Good Luck! Thanks so much for your input! I will check out the web site you suggested! each as they thoroughly enjoy baking at Christmastime!! You’re welcome, Ruth! I hope you find some fun aprons for Christmas.